Gervas was educated at Lancing College, the Senior School in the Woodard Corporation, a Christian foundation in the Anglican tradition. He then went on to New College, Oxford, another staunchly Cristian establishment. 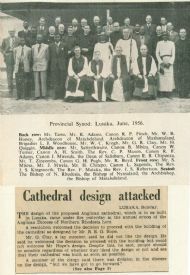 In Northern Rhodesia he became a member of the Synod, and a lay reader, which he continued upon his return to Endland - eventually to become the oldest lay reader in England.